This handsome fellow is Rascal. 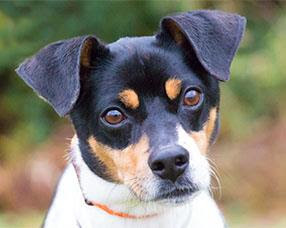 He's a rat terrier mix who is about 7 years old. Shelter staff and volunteers report he's a friendly, happy guy who needs a little training. Rascal is food motivated and he loves chasing tennis balls. Hi Everybody...My name is Rascal, and I'm a ball of energy! I'm almost 7 years old, but you'd never guess it. 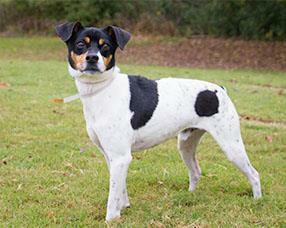 I'm a rat terrier mix and a good looking little boy, if I do say so myself! I think my coal black ears, little white nub of a tail, and my happy personality, will charm you when you meet me. I sure hope that will be soon. And I hope you decide that I'm your kind of guy. 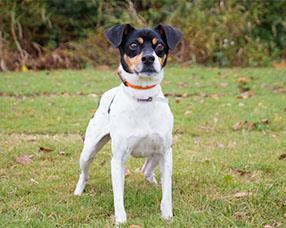 I'm looking for a family that will give me the training and consistency that I need. You see, I haven't had a lot of experience learning basic obedience skills like "come, sit, stay" etc. I'm motivated by treats and toys, so those things should get my attention and help me learn. I just love to play and run, especially when tennis balls are involved! Because I'm so rambunctious, I'll do best in a home without children under the age of 5. I'm curious and enthusiastic about all kinds of things, especially outside, so I'll need to learn good leash manners too. A harness would be best to help me control my impulses and keep me from pulling. (There's something about squirrels that just makes me want to run and chase!) And I would really appreciate extra exercise and games where all my energy would be put to good use. Agility training might be something that would be a lot of fun for me...and for you too! Speaking of treats, I'm quite good at taking them very gently from your hand. When it comes to eating my meals though, I'm pretty serious. I'd prefer a quiet place to eat, where I'm away from people and other dogs. The nice people here at Wayside Waifs think I'm close to being crate trained. As for house training, I'll need improvement. They would love to talk to you about good ways for me to accomplish that, and I'm hoping you are the patient person that will help me learn. Won't you please come out and meet me soon? I'm so anxious to find a forever home, with a family that will help me become the best dog and companion I can be. Will it be you? When you come, please bring all members of the family, including furry ones, just to make sure we all get along. I'm hoping we'll be the perfect match! For more information about Rascal, contact Wayside Waifs at 816-761-8151. Rascal, sending prayers that your forever family comes soon and you get all the love you deserve!! We are sending prayers to you too Sue. Thanks for stepping so quickly back into helping dogs needing homes - you're strong! What a little cutie! Sharing and hoping he finds a home soon. He sounds like he's ready to learn and become a perfect pet. Hi Rascal, your handsome. Sharing.